Bluesound Node 2i review | What Hi-Fi? For a moment, just ignore that the Node 2i wireless streamer is part of Bluesound’s multi-room family, and avert your eyes from its strong features list. In our view, this is simply the best sounding product of its type you’ll get your hands on for less than half a grand. It marks quite the return to grace. When we named Bluesound’s second generation system our multi-room Product of the Year in 2015 - a title its predecessor had achieved the previous year – the Node 2 was an integral component. However, in the lengthy period of time afterwards, it was little surprise that other manufacturers not only caught up, but surpassed the Node 2’s performance considerably. The arrival of Arcam’s rPlay streamer last year was a spanner in the works. It offered improved sound in a similarly compact unit at a substantially discounted cost. Consequently, the Node 2 dropped from five stars to three. With a cursory glance at the Node 2i’s spec sheet, nothing much appears to have changed between the models to dictate so dramatic an upturn in this generation’s sonic performance. However, Bluesound has worked on improving its wireless streamer, and not just in the places you may expect. Between the releases of these two multi-room generations, Bluesound's parent company, Lenbrook, created the NAD Masters M50.2 BluOS network streamer, and the Node 2i’s upgrades begin with trickle-down high-end circuit design and architecture from there. The layout was then optimised to accommodate its new chassis, and further isolation was put in between audio and wi-fi frequencies. The new, smaller wi-fi chipset has given Bluesound the freedom to play with the circuit layout – but the company has admitted to being surprised by how much this affected the Node 2i’s audio performance. 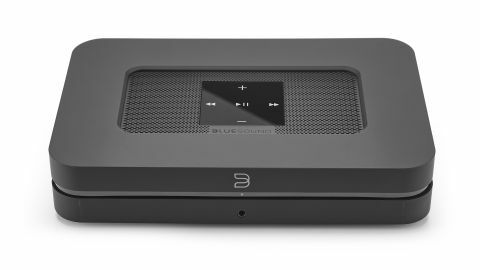 What’s easier to understand are the bonus features Bluesound has added to its streamer, including the dual-band wi-fi, Apple AirPlay2 and two-way Bluetooth, which means you can use wireless headphones via the BluOS 3.0 app, as well as a faster processor for a more seamless user experience. The 32-bit/192kHz DAC remains, as does its long list of connections, including RCA, coaxial, optical and subwoofer outputs, with physical inputs for optical, analogue and USB-A alongside wi-fi, Bluetooth aptX HD and AirPlay2. We wire the Node 2i into our reference system of Gamut D3i/D200i amps and ATC SCM50 speakers, and it is clear that this is a different animal altogether to its predecessor. The richness across the frequencies is retained, but the soundstage appears further opened and with even more granular detail fed in. It feels far from out of place in our reference system, which merely offers the Node 2i a canvas to display its abilities. What’s most striking is the improvement in this streamer’s organisation, timing and dynamic expression. Those facets were bettered by the Arcam, but Bluesound has not only cleared the confusion within the Node 2i’s presentation, but made musicality one of its most alluring fortes. It is in the subtleties of a composition that the Node 2i really thrives, showing its ability to pick out the varying intensities of a fingerpicked guitar, arpeggiated piano line or call-and-answer arrangement that may provide rhythm as much as hold a melody. There is greater life to the performance as well; the Node 2i shows not only an increased level of expression but also enthusiasm. Its considerable bass weight, while always supporting a full-bodied midrange, now also adds kick and drives forward proceedings. The Arcam rPlay remains a fine streamer for the money, but that really serves to highlight just how far Bluesound has come since its previous generation. Though the space between them is not massive, the Node 2i betters its rival pretty much across the board. As far as sub-£500 wireless streamers go – whether incorporated into a Bluesound multi-room system or not – you almost certainly won’t achieve sound quality superior to that of the Node 2i.